I’m sure you’ll agree that website copy should lock a prospect in a tight grip, lull their objections, excite them about a product, and seduce into making an inquiry. But I bet that looking at traffic data you feel prospects run away confused, bored, or perhaps even annoyed. Bounce rate is sky high, average time on site is barely noticeable and nobody seems to be reading everything you have to say. But what if that was the problem exactly? What if the amount of information and how you present it is driving away prospects? You know, it’s kind of scary. It turns out that humans now have shorter attention spans than a goldfish. According to this research, our attention span on the Web is only eight seconds. The attention span of a goldfish, however, is a second longer. It also means that you have only eight seconds to grab your readers’ attention. And chances are you waste it with warm-up paragraph. That’s copy that does nothing else but beat around the bush until you’re finally ready to introduce the key message. If the first 20 words, or about two paragraphs of your copy, don’t introduce the problem, remove them. Chances are that they’re there only because you needed to warm up to finally write the key points. There is one other thing to remember when you write Web copy: Your prospects are in a rush. They have other websites to visit before making the buying decision. And the quicker you tell them what they need to know, the bigger the chance they’ll remember you and come back to buy. I know, features are easy to write. After all, they’re tangible aspects of your product, functionality or technology behind it. They can also take a lot of space on a page, making it seem richer with content. At least, not until a prospect had familiarized him or herself with your business. Why they should buy from you. Lists of features only distract them from finding it out. When writing your web copy, focus on benefits – tell visitors what they are going to gain by using your solution. And leave features for the last stage of the buying cycle, when you’ll have to overcome your prospects’ final sales objections. You can’t write content that satisfies everyone. Or fill a single page with arguments that’ll speak to and attract different audiences. But chances are that you really don’t need to target them all. Less Accounting is open as to what audience they’re trying to attract: business owners who dislike bookkeeping. But what if you need to target a secondary audience too? Use a separate, dedicated landing page. 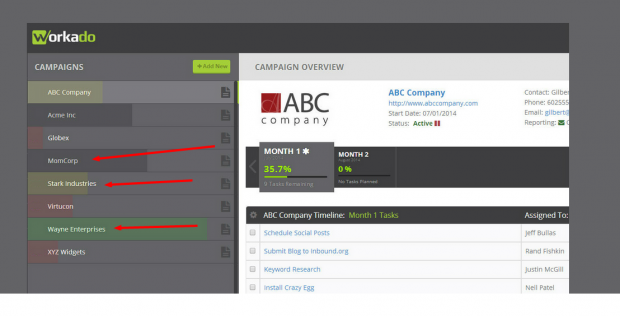 (Less Accounting’s site features additional landing pages targeting other customer groups). 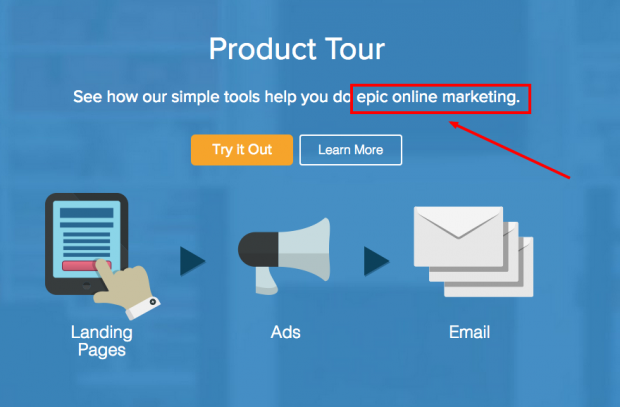 Wishpond product tour page mentions epic content marketing. And it a one thing every marketer strives for? It’s an interesting fact – our brains process images 60,000 times faster than text. This means that visitors will have made up their mind about your page before they finished decoding the copy. How? By processing images and other visual cues. To make your copy more effective you need to back it up with relevant images. In a case of landing pages, ones that communicate who a page is for. 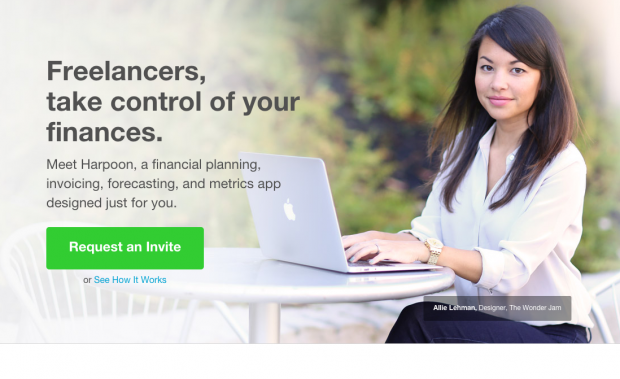 Harpoon features an image that backs up the main headline – a contempt looking freelancer. Lastly, nudge your audience with something only they will understand. Use cues to connect with them on emotional level,too. Workado’s product screenshot features projects from companies like MomCorp, Stark Industries and Wayne Enterprises. I’m sure every geek or comic fan will know what these are. This may come as a surprise but, you don’t have to elaborate on all points. Some are self-explanatory. Others are easier to consume in a condensed form. And some ideas might be easier to understand if they’re abbreviated. In such cases, convert them into bulleted lists. They grab the reader’s attention. Help them focus on the key message of your copy. Break the dense chunks of text. And make it easier to scan. You know, sometimes the best way to connect with a reader is by telling her that you know how she feels. That you’ve been in her situation before and can relate to the problem. 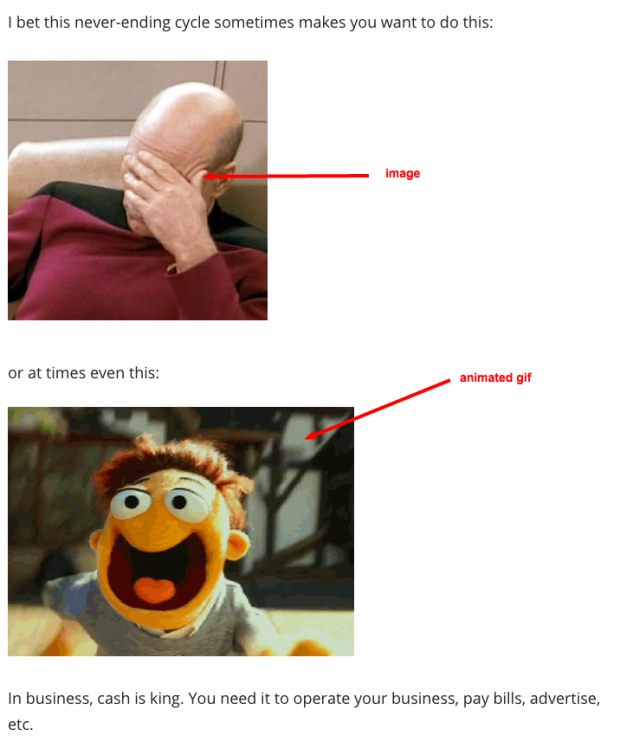 In those situations, communicate emotions with an image or animated gif. Numbers stop a wandering eye. When you have to use statistics or data to back up your points, use digits instead of words. Numbers make the copy easier to scan too. Also, readers often associate them with the most important information on the page and thus naturally seek them out when skimming through it. In one eye-tracking study. Jakob Nielsen discovered that numbers often work well to stop a wandering eye, even when they are embedded within a mass of words. Numbers represent facts. And that’s what readers are often looking for. The shape of a group of digits is significantly different from a group of letters. That’s the reason why they stand out in the reader’s peripheral vision. Take a look at this example: the number 2015 looks different from the word five. And yet they both include the same number of characters. Keep these items above in mind the next time you’re producing website copy to seduce your prospects into becoming your new customers. A recent chat on small business productivity looked at cloud services among other options as a way to create a more dynamic company. The chat also included general suggestions on how to be more productive. Moderated by Small Business Trends founder and CEO Anita Campbell (@SmallBizTrends) and Smart Hustle Magazine publisher Ramon Ray (@RamonRay), the chat featured plenty of participation. There were also many discussions on using technology to improve productivity including this tweet from Ray. Microsoft representatives and members of the Microsoft community were also on hand to discuss how small businesses could shrink costs and improve capabilities through the cloud. The chat got started with a discussion, prompted by a question from Ray, about what tips participants could offer to boost productivity. During a discussion on cloud solutions as one option for improving productivity, here’s a brief explanation of Microsoft Azure by those who know. The cloud can better your business in a variety of ways, beginning with lowering costs. Check out this exchange for more specifics from chat participants. Small businesses are quickly adapting to cloud technology, probably because they have the most to gain. These tools add significantly to their capabilities without the need for big investment. #MSFTBizTips A5 Definitely. My clients are moving to the cloud rapidly. Search tools, word processing- & my fave, cloud storage! Security of data is often a worry expressed by businesses when considering a cloud option. But consider the alternatives of your valuable data stored only on a local server — or worse yet, on your laptop! 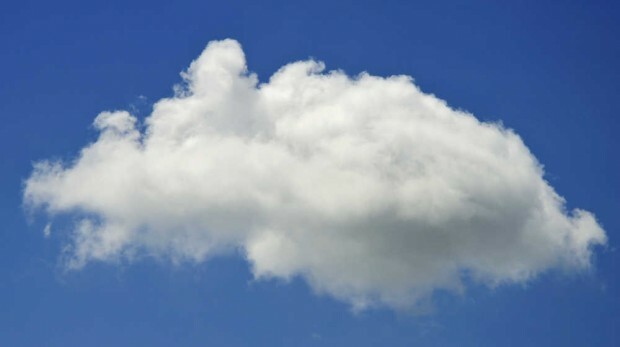 Maybe you’ve made up your mind that the cloud is a good fit for your business. But the services and option can be a bit overwhelming. Fortunately, there is plenty of information available. At the time of the chat and creation of this article, Anita Campbell is participating in the Microsoft Small Business Ambassador Program. In a single day, we create more than 1.5 billion pieces of content, including 140 million tweets and 2 million videos, according to this great infographic on “big data”. It’s no surprise that even with the most careful planning, our marketing messages often get lost in the data chaos. On the flip side, how many articles we see on a daily basis and mentally mark as “interesting” but fail to ever read or save the great data within the article? Infographics are a visually compelling communication medium that breaks down complex data into easily digestible content. In essence, they’re the perfect marketing solution for a world that’s overrun with interesting data and lacking an effective means for organizing this information. Ninety percent of the information that comes into the brain is visual. Infographics help us quickly and easily visualize relationships between statistics. But great infographics are more than just a powerful data visualization tool for content marketing. They’re also an effective viral marketing tool for taboo products that are in high-demand but not always easy to advertise through traditional channels. Case in point: an online STD test. While there’s clearly a built-in market for STD tests, you can’t just buy a commercial during the Super Bowl and call it a day. Not only would such a commercial be prohibitively expensive, but it would also be a bit awkward and uncomfortable for viewers at home to see in between their favorite chip and beer ads — and it might even turn off your target audience. For a socially taboo product, you need to think creatively about how to get the word out to potential customers. Infographics focused on raising awareness about a relevant issue are the perfect solution. Even with a clever infographic, a collection of random, dense statistics is still a collection of random, dense statistics! Don’t just grab a bunch of random facts and throw them into your infographic. You need to think strategically about which statistics to include. One option is to select data around a problem or issue that individuals in the target market may not realize is as common as it is. Diaper Buys created an infographic that shows the different causes of adult incontinence and aims to remove some of the stigma associated with wearing an adult diaper. Another option when creating an infographic would be to addresses a common issue that individuals in your target demographic may be experiencing, even if this issue is only tangentially related to the product that your business is selling. For example, older individuals who need adult diapers may also face additional challenges in their daily lives, especially if they live alone. Diaper Buys created just such a demographic for “National Senior Independence Month”. Organizing the data around an awareness theme makes the infographic relevant and timely, two key characteristics of viral content. If you are not a graphic designer, it’s probably best to leave the heavy lifting to someone who is. After all, you don’t want a poor design to cloud out your message! The good news is that you don’t have to spend a fortune on great design. Visual.ly, one of the world’s most popular infographic sharing sites, can also connect individuals with a graphic designer for affordable infographic design. After the infographic is complete, you can create your own business profile and publish the infographic directly on the site. Once the design is complete, think strategically about the best ways to get your infographic out to the right target audience. In addition to sharing the infographic via Visual.ly, be sure to post it on your company’s blog and cross-post on Pinterest (one of the most popular social networks for infographics) as well as other social media channels. Tweet a different, interesting statistics found in the infographic each day for a week with a link back to your company’s blog post. Share it on Facebook and include a link to your company’s weekly newsletter digest (if you have one). The key is to get cross-posts on as many relevant platforms as possible. 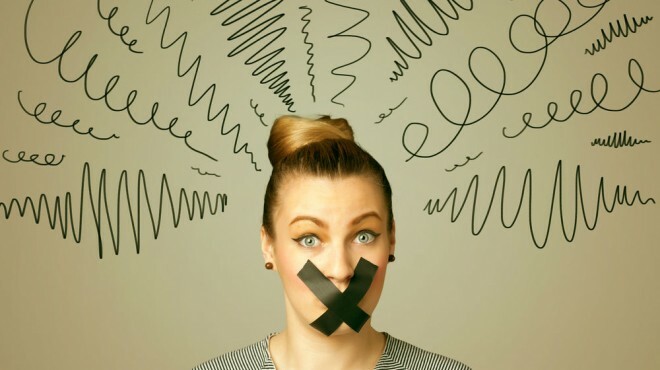 Marketing a taboo product or service can be tricky, but by using infographics to focus on an educational or awareness-building angle, you can position your product for viral marketing success. The election of a new Governor of the Bulgarian National Bank (BNB) should be completed as fast as possible, according to Petar Andronov, Chair of the Association of Banks in Bulgaria. The term in office of the current BNB Governor, Ivan Iskrov, expires in October. Andronov, as cited by the Bulgarian National Television, declared Sunday that the discussions were taking too long, taking into account that the BNB Governor, once appointed, would have to nominate a Deputy Governor who would be in charge of the Bank Supervision unit. As regards the nomination of Dimitar Radev from the International Monetary Fund, he said that he only knew that he enjoyed the trust and support of all of his colleagues. Anrdonov underscored that a director of the Bank Supervision unit was needed urgently. As regards the upcoming procedure for the assessment of the quality of assets of banks, he made clear that the preparations had been underway for over a year. He noted that the procedure had been carried out by the eurozone’s 120 largest banks before they were placed under the supervision of the European Central Bank. Andronov said that the methodology was clear but BNB had to adapt everything to the domestic conditions. He declared that the Deputy Governor of BNB would have a lot of work to do in connection with the preparations for the procedure as a failure would have a disastrous impact. Andronov argued that Bulgaria was not the only country which had not adopted the EU’s Bank Recovery & Resolution Directive, adding that it was a very complex piece of legislation. He said that the downward trend in interest rates on deposits appeared to be ending, adding that it was likely to happen soon with interest rates on loans. Had I remained in my corporate job in London which I decided to leave some 13 years ago, I am not certain that I would have much of an idea about social media and all the marketing opportunities that it opens up to the small business entrepreneur. 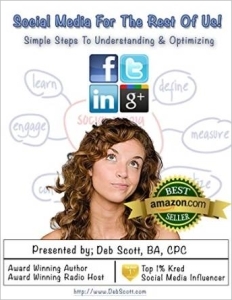 “Social Media For The Rest Of Us: Simple Steps To Understanding & Optimizing Facebook, Twitter, LinkedIn and Google+”, by Deb Scott, is a brief guide to using the four main social media platforms for the purpose of promoting oneself. For the younger generation of tech savvy entrepreneurs the book “Social Media for the Rest Of Us” will appear to be over simplistic. However, there are many from my generation who have moved on in life to become motivational speakers, authors, and even decided to start a small business for themselves. For them, this book is an ideal starting point to learn the basics of how they, too, can make use of social media to promote themselves or their business. The author starts by explaining the benefits of having a presence on each of the four major platforms. The “simple steps” needed to be taken to achieve this are provided together with the links to enable the reader to create an account on each platform. “People can’t find you if you are not there …”. Deb Scott (@GreenSkyDeb) continues by explaining that it is through the use of social media that customers and followers can be obtained, and how this can serve you well in the promotion of a service or product. She advises that studies have shown that when attempting to engage your customers and followers that the best way is through the use of images and pictures. By the use of screenshots from her own profiles on Twitter, Facebook, LinkedIn, and Google+, the author details the type of information that should be placed on a profile, and underlines the importance of completing all the information fields available. Having dealt with the process of creating a profile on each platform, she goes on to give some brief hints and tips on the best ways to use each of them. For example, in “Social Media for the Rest Of Us” she recommends that when using Twitter that you regularly check your home page to see who has retweeted any of your tweets, and that you should make sure to thank them for doing this. Additionally, she advises that the creation of lists and getting on Twitter lists will help to enhance your credibility and visibility. “You are in a venue where people are already in the mind-set to do business with you”. To measure your success and amount of followers on these social media platforms, the author explains in “Social Media for the Rest Of Us” how she does this through the use of Klout and Kred. Kred is preferred by Scott as it appears to be more transparent and only measures your impact on Facebook and Twitter. Klout, on the other hand, measures your impact on Instagram and Foursquare as well, which the author admits to not using. The final section is a seven-page glossary of keywords and terms used on the Twitter platform. If you have never used Twitter before and want to start using it you may find this section of some use. However, as the author states herself and references for the benefit of the reader, there are many books and blogs available to get a more in depth knowledge on how to get the most from Twitter. Should you have yet to discover the various social media platforms and all that they can offer you in the marketing of yourself or your business, or if you are simply overwhelmed by all that is available, then this should serve as a useful starting point. Deb Scott is an author, motivational speaker, a certified professional coach and a Top Rated & Award Winning Radio Host. Through the use of her 20 years of sales background, she specializes in working with individuals, businesses, and in the corporate environment. To read more about the author you can visit her website. You are currently browsing the Business, finances, forex blog archives for May, 2015.